Forget ‘mobilegeddon’, Domino’s Pizza has just single-handedly created ‘emojigeddon’. Was this an employee prank? A weird joke? An as-it-happens account of a personal breakdown? None of the above. It was, of course, a promotion. As Adweek reported Wednesday, Domino’s was bringing attention to its new Twitter-based delivery service. From May 20, the brand will allow customers to order pizza via Twitter, simply by tweeting a pizza emoji to Domino’s account. Customers will have to link their Domino’s account to their Twitter account for the feature to work. We wanted to start a conversation about why Domino's has gone emoji crazy in the lead-up to the emoji announcement. 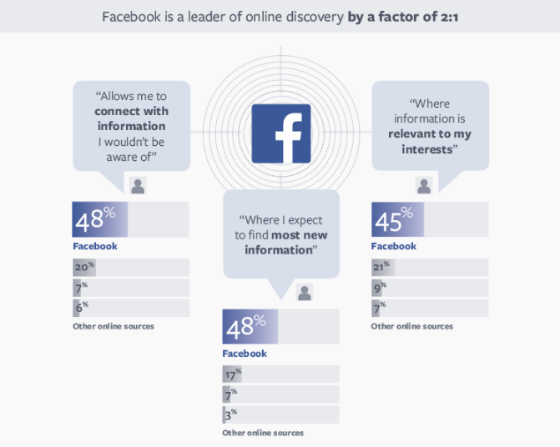 Facebook is leading the way when it comes to digital content discovery, according to a new study by Millward Brown Digital, commissioned by Facebook IQ. Allowed them to connect with information they wouldn’t be aware of. They would expect to find the most new information. Where they would find information relevant to their interests. In every case, Facebook received more than twice the responses than the next most popular online source. The study also found that 67% of survey participants discovered movies on Facebook, followed by 66% who used it to discover TV shows, and 63% who used it to discover music. According to Marketing Land, citing the report, total Facebook customer engagement has surged by 43.5% in the last year. The most engaging post types were links and photos, with Facebook video also showing strong performance. 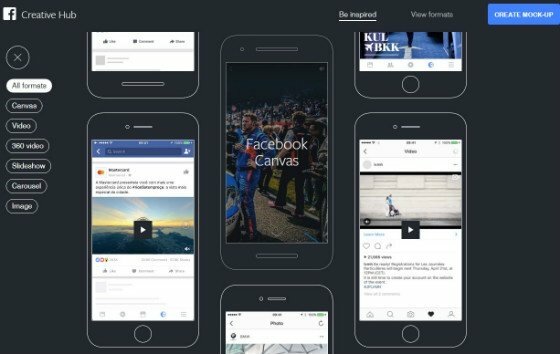 Facebook has introduced ‘Instant Articles’, a platform that lets publishers create interactive articles within Facebook itself. In its blog post announcing the platform on Tuesday, Facebook said that Instant Articles will load “as much as ten times faster than standard mobile web articles”. Facebook has also promised interactive features, such as auto-play videos, high-resolution images, interactive maps, audio snippets and – perhaps most interestingly – the ability to like and comment on individual sections of articles. The BBC, The Guardian, Buzzfeed and The New York Times join five more publishers as launch partners for the platform. The New York Times already has a significant and growing audience on Facebook. We’re participating in Instant Articles to explore ways of growing the number of Times users on Facebook, improving their experience of our journalism and deepening their engagement. 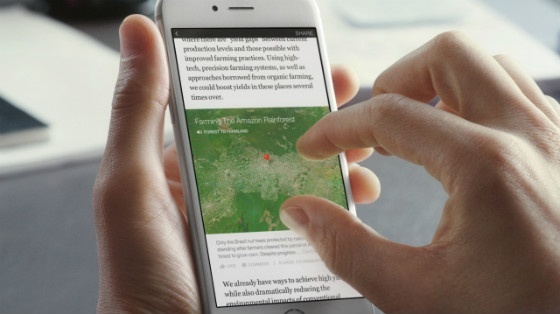 Instant Articles is launching first for Facebook’s iPhone app. Facebook has created an immersive landing page promoting the platform, which you can view here. Facebook is trialling a feature that lets users search for links to post without leaving the Facebook app, TechCrunch reported Monday. Certain iOS users are seeing an ‘Add a Link’ button when they add a post. Tapping the button brings up a keyword search engine where users can enter a query and see a list of matching links to share. Click for full-size version. Source: TechCrunch. TechCrunch says the feature also lets users preview what’s on the linked site, and appears to order links by the likelihood that the user will want to share them. Facebook has confirmed that it is testing the feature, and told TechCrunch that the search engine is powered by an index of more than one trillion links, taken from links users have already shared on Facebook. 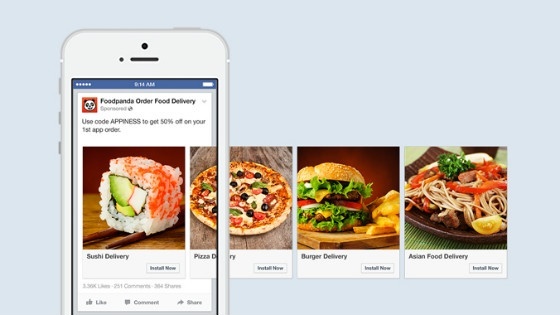 Facebook launched its carousel ad format for mobile app ads on Monday. Carousel ads, which lets advertisers embed multiple links and images in one ad, launched in June last year. Facebook says the ad format has seen advertisers enjoy 30-50% lower costs-per-conversion and 20-30% lower costs-per-click. The ad format can now be used for app install and engagement ads. It is available now through the Facebook ads API. Facebook has made it easier for consumers to contact local businesses by introducing ‘Call Now’ buttons in News Feed ads. As Marketing Lands reports, the new call to action buttons appear for local business ads in mobile users’ feeds. Users who click the button are taken directly to their smartphone’s dialer. The new buttons have been introduced as part of Facebook’s ‘local awareness’ programme, which the company announced back in October. The programme aims to make it easier for businesses to engage with local customers on Facebook, using a special ad format. More good news for Facebook marketers – nearly three-quarters of global web users are visiting the social network at least once per month, according to new research by GlobalWebIndex. The GWI Social report polled more than 47,000 internet users across 33 markets in Q1 2015, and discovered that 73% of users are visiting Facebook on a monthly basis. The report also found that Facebook still has the most active members (82%). 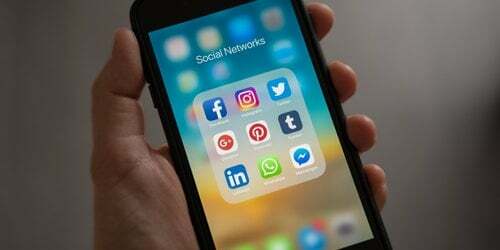 However, it was the only social network studied that showed a drop in active users during the last year, losing nine per cent. However, Facebook’s position as a ‘cool’ social network is becoming precarious – at least amongst the younger generation. Although 37% of adults said they considered Facebook the “coolest” platform, just 14% of teens shared the same opinion. In teenagers’ eyes, YouTube is the coolest social network (20%), followed by Instagram (16%). Still, Facebook is considered cooler than Tumblr, Snapchat, Pinterest and Twitter by both age groups. 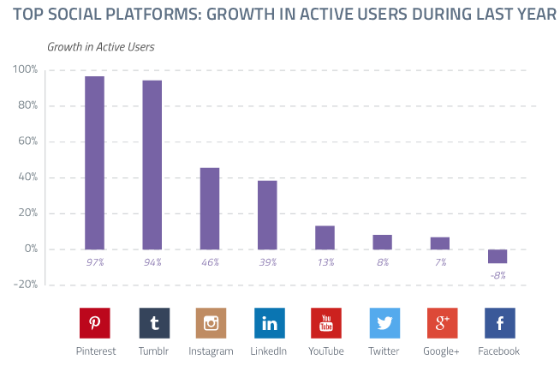 More insights from GlobalWebIndex’s GWI Social report – Pinterest and Tumblr are by far the fastest-growing social networks in terms of active user growth. 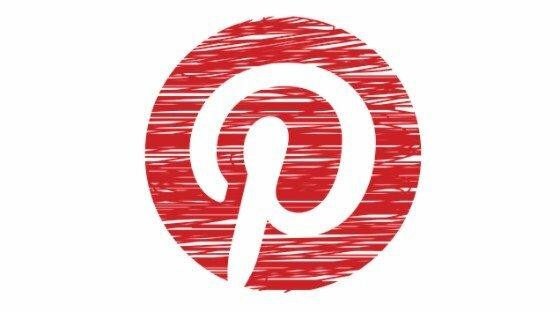 Over the last year, Pinterest’s active user base has grown by an impressive 97%, and Tumblr isn’t far behind, enjoying a 94% growth. Instagram, the next fastest-growing social network, saw its user base rise by 43%.  Social share buttons are shockingly underused by mobile users, says a new study by Moovweb. The mobile optimisation firm studied a subset of its customer data, and found that just 0.2% of customers ever tap social sharing buttons on mobile devices. This means mobile users are 11.5 times more likely to click an ad than a social sharing button. Users are 54% more likely to click a social sharing button on desktop than mobile. Read last week’s social media news roundup: Google+ Launches ‘Collections’ – But is it Enough to Save the Social Network? Download your free content marketing guide – learn how to tie social strategy to content to generate ROI.